The OSU Lab Test service allows you to take control of your own health in between physician visits. Assess your current health status. Monitor the effects of your change of diet and exercise. Follow up on your chronic disease. 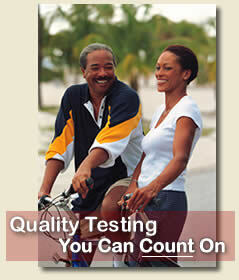 Receive completely confidential test results delivered directly to you. All testing is completed by The Ohio State University Medical Center Clinical Laboratory, a laboratory dedicated to producing accurate results using state of the art methods and technology. Purchase the OSU Lab Test card by calling (614) 293-9289. Come to the designated collection center in your area for specimen collections. Get your report online at http://www.osulabtests.com and in the mail. The OSU Medical Center Clinical Laboratory is fully accredited by the College of American Pathologists (CAP), American Association of Blood Banks (AABB), Joint Commission on the Accreditation of Healthcare Organizations (JCAHO), Clinical Laboratory Improvement Amendment (CLIA) and the Food and Drug Administration (FDA).